It had been a warming Saturday morning of fishing and playing with the dog on the bank of the Big River, and after no luck with the inhabitants in the fast moving water, we opted for a different activity. 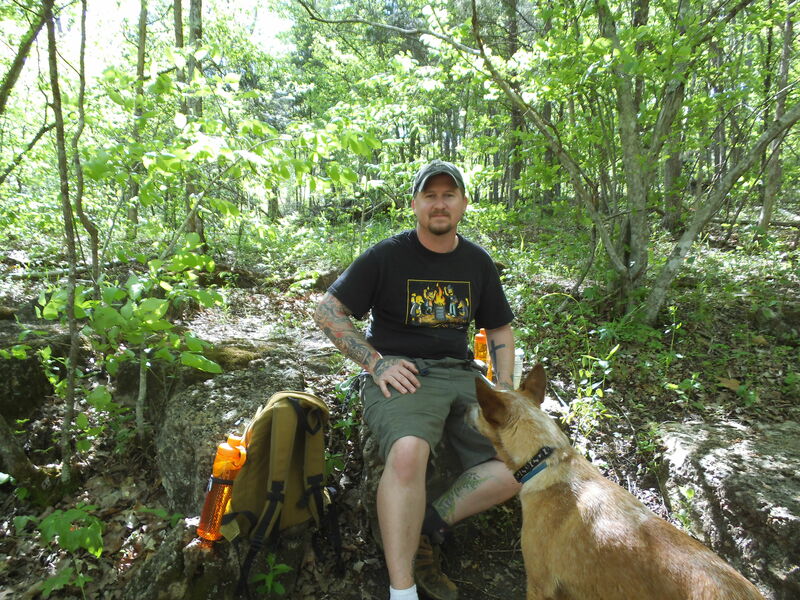 Luckily for us, we were in the park that is home to probably my favorite hiking trail out of all the trails I’ve been on in Missouri. It was time to enter the Coonville Creek Wild Area and hike the Mooner’s Hollow Trail! From south St. Louis County at the 55/270 interchange, take 55 south around 20 miles to 67 south at exit 174B. Then stay on 67 south for about another 20 miles. It will be a left turn across the divided highway to get into St. Francois State Park, probably 5 miles before you hit Bonne Terre, MO. Once you’re in the park, just follow the main road down into the valley, and the trailhead will be in the picnic area on your left. 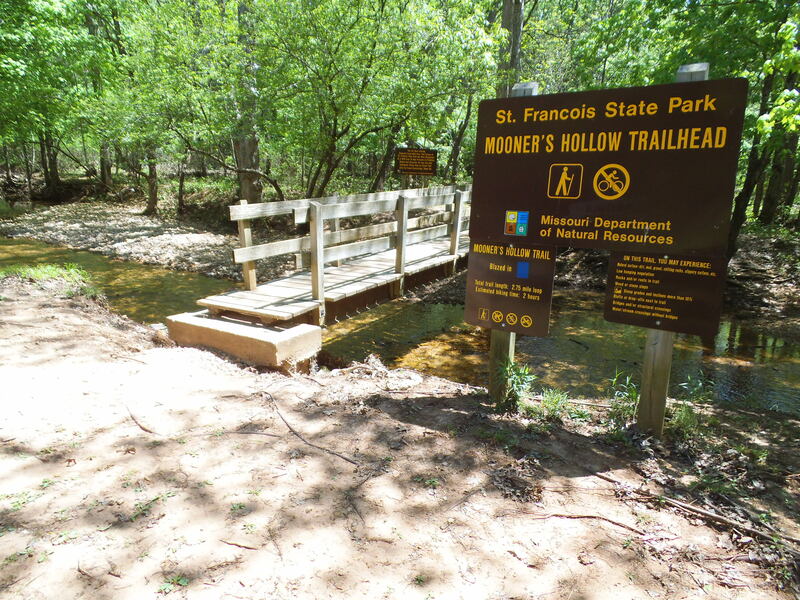 The trail starts out with a wooden bridge that crosses Coonville Creek, and then turns to the left and follows it northeast into the woods through the hollow. This first part of the trail pretty much stays on the same heading, going up and down the hills on your right, as it parallels the creek for just over a mile. Along this path, Coonville Creek snakes away and then back to the trail a couple of times, allowing for scenic moments to stop and look down from the slightly elevated bluffs, or along the large-pebbled banks that the trail takes you over. At one point it turns slightly to the right and takes a bit of a steep incline up to a glade that allows for views of the hills on the west side of the hollow. 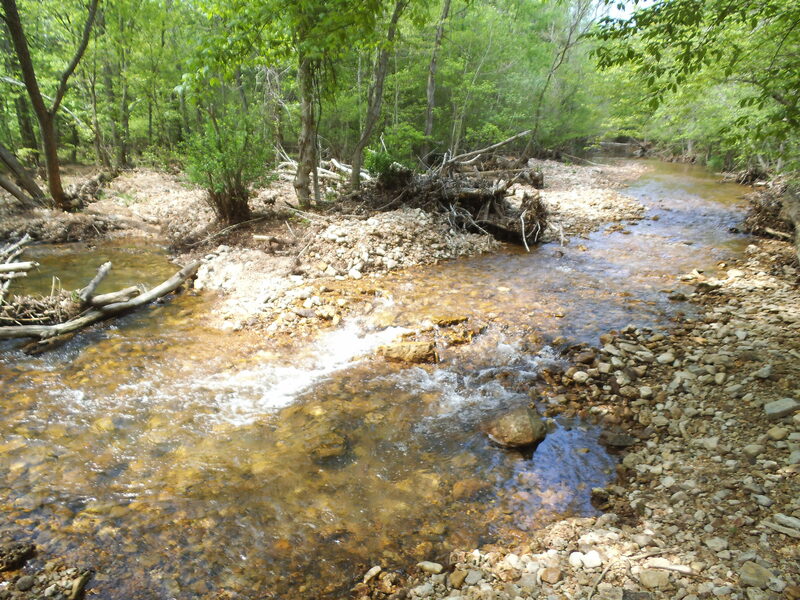 It eventually returns to the creek bottom, and the gurgling and splashing of the playful water is a welcome auditory companion as you head toward the creek crossing at the farthest point it takes you into the woods. 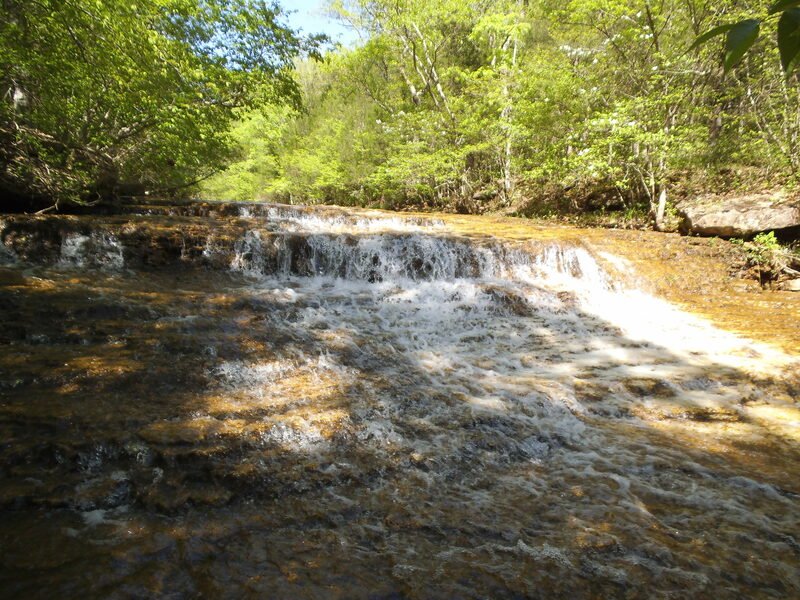 When you do get to the crossing, take a few moments to look up the creek to the waterfall just to your right. There is a little muddy spur trail on the other side that will take you to it, despite the best efforts of a small wooden roadblock. Sitting on the rocks next to the waterfall, as you watch the water spread out and flow over the stone that makes up the cascading steps down, is the perfect spot to stop and have a snack and a take a rest. This would be my ideal place for a backpacking campsite, if I had the authority. To spend the night just up the rise from the moving water would make for a wonderful backpacking experience, in my opinion. So after you return to the trail from your snack break, it turns back toward the direction of the picnic area, but you still have over a mile and a half to get back. It comes up out of the creek bottom and starts to head up into the hills toward 67. You have a couple of climbs and a few creek crossings, including what is probably the steepest part of the trail, before it makes it’s way through a recently cleared glade that has some really interesting looking plant life. 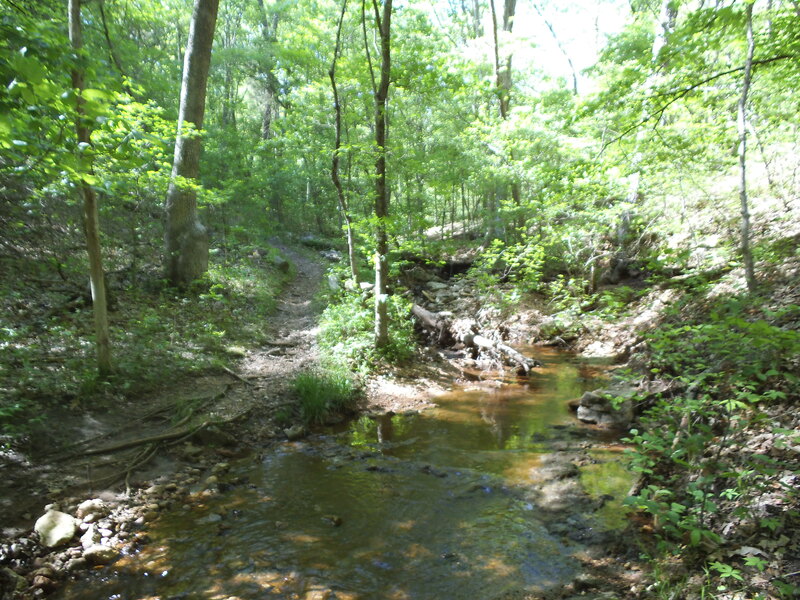 Take some time to observe the contrasting environments you are hiking through, the hardwoods and the glades, just before you start through a more cedar rich forest that eventually takes you back to the creek and out to the picnic area. Like I said, this is probably my favorite trail to hike. It is just under three miles so it is just right for a good family hike, and there is a lot to see. 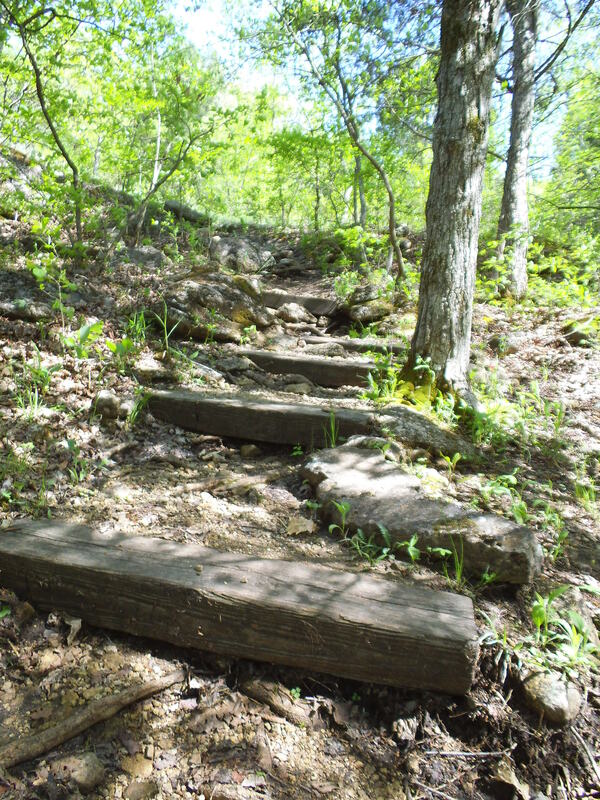 From the hardwood trees to the cedar creek bottoms to the warm sunny glades to exposed boulders dotting the hillsides with vegetation popping from their soiled crevices, it is exemplary of the diversity within Missouri forests. The cultural history is something to be learned of as well. 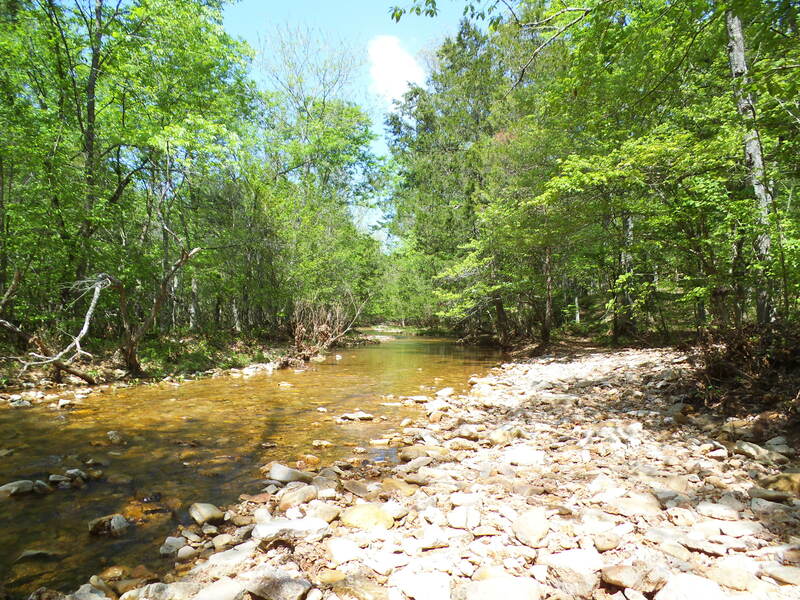 Along with it’s connections to the Civil War through the families that lived in the area at the time, Mooner’s Hollow is named after the distilling operations that used to take place in the the forest along this clear water creek, back in the days of the moonshiners. It is relatively close to home. I can make it to the trailhead from my front door in 45 minutes, given ideal conditions. I know this because I hike it enough, and it never seems to be too far of a drive if I haven’t been there in a couple months. I wouldn’t consider this trail difficult by any means, but along with creek crossings, it does have some areas that tend to hold the rain water and create some muddy spots, so dress your feet appropriately. There is also one hill on the way back that can be a bit of a workout, if you take the trail counter-clockwise like I do. I call this “the bad part”. Take your time and appreciate the almost panicked feeling of life within your lungs and legs. 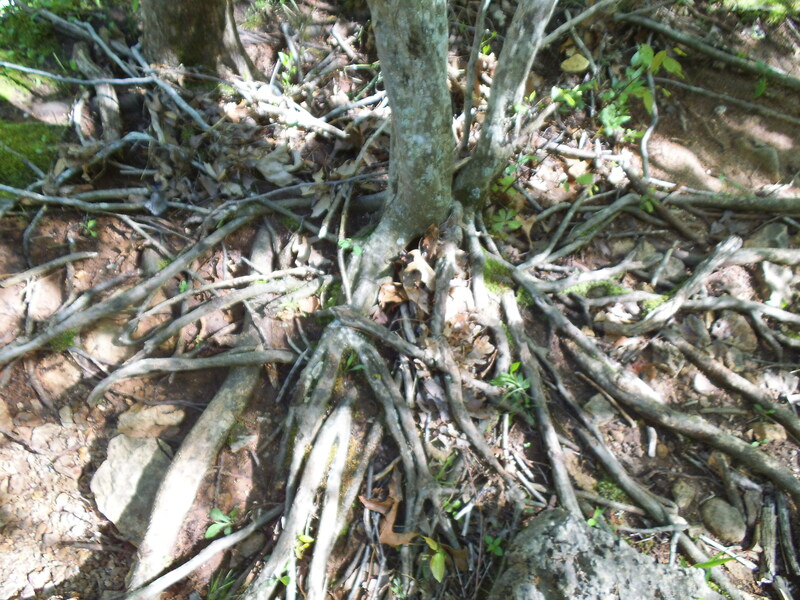 As cool as I think they look, there are some spots along the trail that are home to a bunch of exposed roots. Step carefully to avoid tripping or getting a twisted ankle. I can’t emphasize how much I personally love this trail. 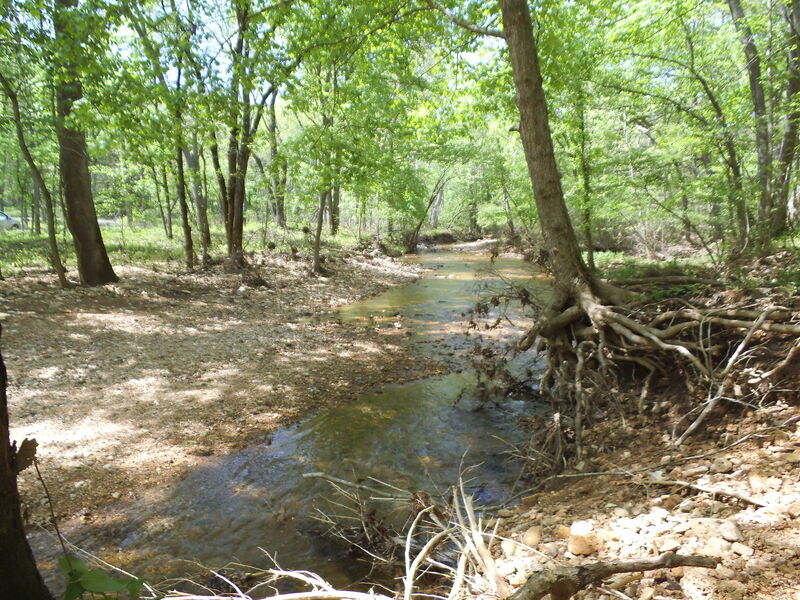 At the risk of getting overly dramatic, there is a magical life energy that flows through the hollow and within Coonville Creek, at least from my experience with it. I have hiked it in the punishing humidity of summer, when it has been covered with ice and mud, and everywhere in between, and even in the extremes of our seasons here in the midwest I still enjoy every minute on this trail. If you haven’t been there, you need to check it out. This is definitely a place to be preserved and kept safe so that everyone gets a chance to experience it. The Mooner’s Hollow Trail, without a doubt the best trail close to home. I can see why this is one of your favorites, I loved the photos of your hike! Thanks! I am in no way anything more than the most novice of photographers, but this place is just gorgeous, so it isn’t too difficult. Once again you make me want to head back to Missouri and do some hiking! Great post. Ha ha! It’s working! Glad you liked it. This really is a great trail to be on. Don’t kid yourself though, you’ve got some really amazing scenery where you live too. I drove the southern route through Colorado about 12 years ago and it was pretty amazing! Beautiful scenery! 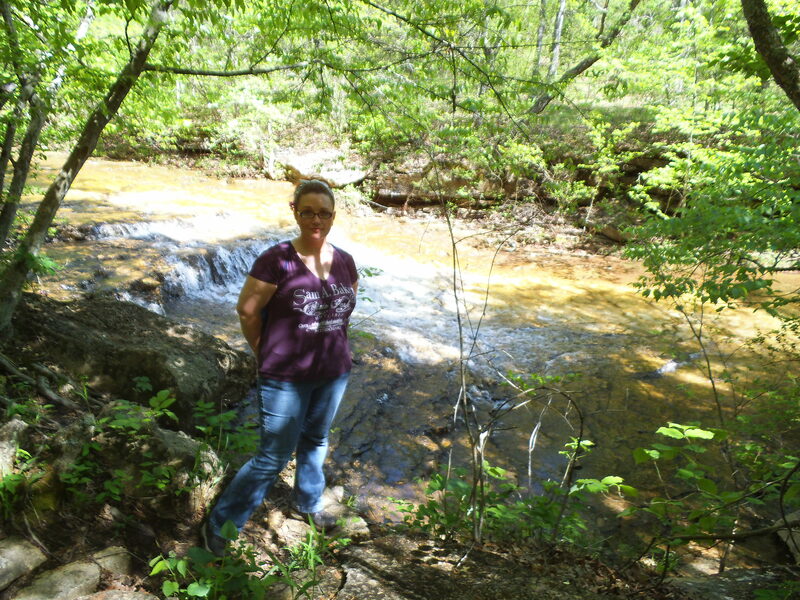 This is why I love living in Missouri… beautiful state parks and forests everywhere! I am definitely taking the fam here this summer! I will also take the opportunity to get some great pictures of the kids! Nature makes the best backgrounds! It really does make the best background! 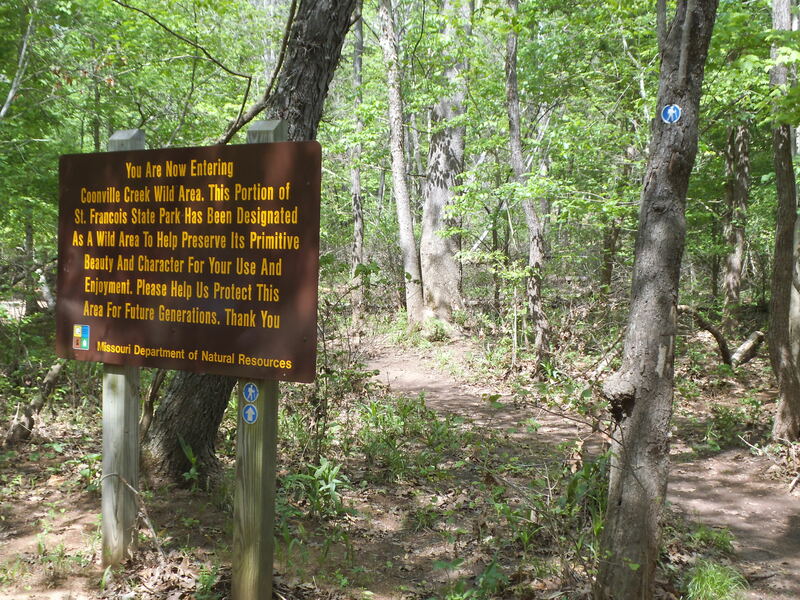 Glad you will put it on your list…I love this trail. Thanks for checking it out!